Canada’s biggest province has lots to do from historical sight-seeing to natural exploration. It’s French influence meanwhile extends beyond it’s language, with many of the cities taking on elements of French cuisine and architecture. If you’ve been thinking of visiting Quebec, here are just a few of the activities worth trying. Quebec City is popular for it’s European charm – walking through the Quartier du Petit Champlain is like being transported across the Atlantic to a medieval town in France. It’s a popular romantic getaway and there are many luxury hotels such as the Quebec City Marriott Downtown that are perfect for a honeymoon. The restaurants in Quebec City are also diverse and vibrant. 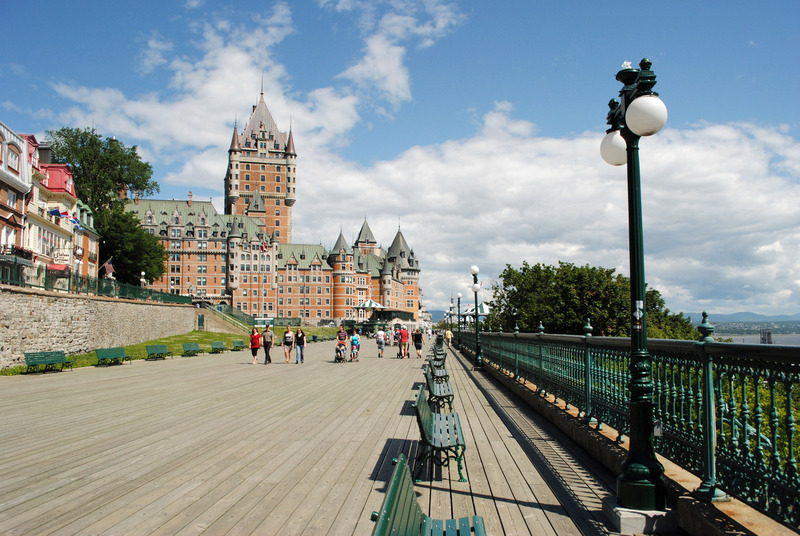 Popular sights include the might hotel/castle Chateau Frontenac and the Citadelle of Quebec. A horse drawn carriage ride through the city is also a must! Quebec’s other major city Montreal has an equal amount of attractions from the Botanical gardens to the various churches such as Saint Joseph’s Oratory. One of the most popular things to do in this city however is to climb Mount Royal – the mountain from which the city gets its name. It’s located in the heart of Downtown Montreal and offers a green escape from the urban environment of the city. Visit on a Sunday and you may also catch a tam-tam – a weekly festival containing drummers, dancers and local vendors. Montmorency Falls is a stone’s throw from Quebec City and is a waterfall one-and-a-half times taller than Niagara Falls. You can ride a Gondola up to the top and take in the views. Alternatively, if you’re feeling adventurous, you can take a hiking trail up to the top. There are also great restaurants nearby worth visiting including Manoir Montmorency with great views of the falls. Those eager to see some Canadian wildlife should venture to Parc Omega between Ottawa and Montreal. Here you may spot ibex, boars, coyote, bison, bears, beavers and even wolves. You can take your own car through this safari park and see the wild animals up close – a 9 mile route takes you through valleys and forests, passing lakes and fields. You can even buy a bag of carrots at a nearby gift shop to feed the ibex with. Located in Gatineau, this historic museum was opened in 1856 and contains over 4 million exhibits. There are mighty totem poles and pieces of uncovered native art from centuries ago. There are also exhibits celebrating more modern history since colonialism and Canada’s independence. It’s one of the most popular museums in Canada and is family friendly, even sporting a kids’ section called the Children’s Museum.